In this thorough introduction to the technology behind audio workstations, Dr Francis Rumsey explains not only how digital audio works but also how to make best use of its capabilities. A combined revision of his two successful titles, MIDI Systems and Control and The Audio Workstation Handbook, this new book covers recent developments such as surround sound formats, direct stream digital, new audio project formats, new interfaces and alternatives to MIDI. Desktop Audio Technology begins by setting out principles of digital audio and how these are applied in recording, replay and editing within workstations. MIDI and synthetic audio control is then covered, looking at the means by which artificial sounds can be controlled and manipulated. This is followed by explanations of hardware, including storage devices, buses, computer interfaces and audio processing options. Dr Rumsey then focuses on transferring audio between systems, including coverage of audio interfaces, networking and file formats. The next section examines audio software, providing working examples of different commercial packages that exemplify some of the concepts previously described. The final chapter considers operational issues such as recent spatial reproduction formats, consumer format mastering and quality control issues, as well as troubleshooting and systems issues. 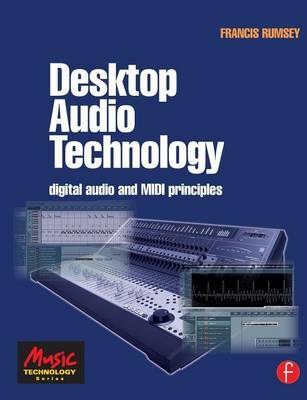 If you are a student, lecturer or practitioner in the field of audio and are looking for an authoritative technical guide to the underlying principles of digital audio and MIDI, this book is for you. Dr Francis Rumsey is a Reader in Sound Recording at the University of Surrey (UK) and a Visiting Professor at the School of Music in Pitea (Sweden). He is a Fellow of the Audio Engineering Society and a regular contributor to the AES Journal. Dr Rumsey is also author of Spatial Audio and co-author of Sound and Recording (with Tim McCormick) and The Digital Interface Handbook (with John Watkinson), all published by Focal Press.